After dressing up as Dean Winchester for Halloween, and having such a difficult time in finding out where to find and purchase clothing/accessories similar to what he wears on Supernatural, I decided to write my own little guide on dressing like him. If you're looking for more detail and variety on Dean's ​shirts, check out my article here. For my article on his jackets, that can be found here. And if you're looking more for his different accessories, you can see that here. What Shirts Does Dean Wear? We all know and love the leather jacket that Dean gets from his dad, John Winchester. This was one of the hardest things for me to find when I was putting together my costume. I eventually found a great replica and ordered it. My original intentions were to return the jacket after Halloween, but I actually liked it a lot and decided to keep it. ​I ended up ordering this replica Supernatural Dean Winchester leather jacket through Amazon. I was actually able to purchase all of the stuff for my costume through them. Amazon also has a great return policy, so if you decide you don’t want to keep anything you can always return it. Usually if you have to pay anything, it’s just the return shipping. Of course you could end up like me and just keep the jacket because it’s so awesome. His original leather jacket was a Wilson’s M. Julian car coat, but it was only made in the 90’s. 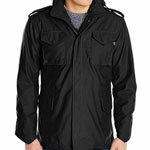 That Wilson’s jacket isn’t made anymore, but Wilson’s does sell a replica of Dean’s jacket now. ​Most of the long sleeve button up shirts he wears are Dickies work shirts. As far as colors go, Dean usually sticks with khaki/brown, black, grey and dark/earth greens. 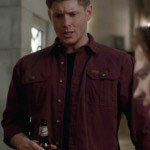 Actually, when I think, “Dean Winchester clothes”, those are always the colors that come to mind. He does occasionally wear a red button up work shirt, but that’s a Carhartt brand. Not that it makes much of a difference, as both Dickies and Carhartt are excellent brands. ​This was actually one of the easier parts of Dean’s clothing to match. The older Winchester generally wears distressed jeans that are a slimmer fit. He doesn’t wear “skinny jeans”, but they aren’t baggy either. Dean Winchester clothes are always the perfect fit. ​You can probably go to most major clothing retailers and find a pair of jeans similar to the ones Dean Winchester wears, but these ﻿distressed jeans are a pretty good match. ​What kind of boots does Dean Winchester wear? He wears a wide variety of boots on Supernatural, but the most common ones are a logger style boot. As far as I could tell through my research, you can never tell exactly what brand of boots he’s wearing. Not to worry! There are at least a couple different styles/brands that look really similar (if not the same). Again, I bought mine through Amazon. I think these boots look almost identical to Dean’s, especially when wearing the right jeans: Chippewa logger boots. ​The boots I bought were actually made by Frye’s, unfortunately they’re not sold anymore. The Chippewas I linked above look almost identical to the boots I bought. And more importantly, almost identical to the boots Dean wears. In my opinion, the way Dean dresses is awesome. It looks great, works for almost any situation, and you keep a pretty manly look. I’ve been going carry trying to find Dean’s Carhartt shirt (the maroon/burgundy one). I know you’ve got a link to one via Amazon but it doesn’t come in that colour.. been searching the whole web and I keep coming up short. I’ve seen them not have the red color before, but they usually come back in stock. That’s the same Carhartt that I bought that I link to above, but I’ll keep an eye on it just to make sure they do come back in stock again. My only other suggestion would be to go to your local Sears (or whoever carries Carhartt in your area) and see what they have there. I feel ya! I wanted that color of shirt myself but Carhartt doesn’t carry it right now. You can get an almost identical one from wrangler. On amazon.com they are called “logger shirts” made under their Riggs brand. They are twill shirts in the style of the Carhartt twill workshirt. I bought my shirt about 4 months before I saw Dean wear his and they look so much alike that I thought it was the same brand(he has worn a green shirt from that brand in another episode). But then they did a close up and you can see the Carhartt label. So, if it’s the color you’re after you can’t go wrong with the Riggs…if you heart isn’t set on Carhartt that is. Actually I took a closer look at the pics. From the stitching and lack of buttons on the collar I think he’s wearing the Carhartt chamois as opposed to the Oakman twill shirt. Xeneize1, the actual model Carhartt shirt that Dean wears hasn’t been in production for years now. So if you’re dead-set on the same exact shirt, you’d have to go used. No kidding? The maroon one? Thanks, I’m glad I didn’t any buckage on it! I am looking to buy the dean’s boots in season 10. Anyone know where to find them ? Are Dean’s boots different in season 10? As far as I recall, his boots never really change. If they do, the costume department has stuck with boots that look almost identical throughout pretty much the entire show (as far as I’m aware). Hey, I really want to buy Dean’s red shirt. I live in Britain. Hey i am looking for a flannel Dean wears in season 10 episodes “The Hunter Games” and “About A Boy” its blue, green, yellow and red/orange. I am going crazy looking for it and am out of ideas. Any ideas where I could find it? http://cdn1.sciencefiction.com/wp-content/uploads/2015/01/supernatural-the-hunter-games-dean-winchester-ackles.jpg This is a link to a picture of it. This flannel was made by Wind River and sold exclusively by Mark’s Work Wearhouse in Canada. Sadly, it is no longer available. I don’t remember which shirt it was, but there is at least one other shirt Dean wears by Wind River in the earlier seasons (1, 2 or 3). Yeah, he has quite a few flannels from Wind River and canvas shirts as well. I have all of the later season ones but the earlier season shirts are impossible to find. Hey, my name is Murilo, I’m from Brazil. I would be so happy if you could help me in finding these clothes in my country, just like the show. I know it’s a lot of work, but you seem to know very well what you’re talking about. Thank you for your time. Hi Murilo, I get this question every once in a while – that is, people from different countries asking for advice. The best thing I can tell you is to search your local Amazon site for the same items I show and see if they’re available. Since I don’t know which stores are and are not available in Brazil, it would be pretty difficult for me to find out what places you could buy the clothing. If you’ve got any military surplus and/or Salvation Army type place around, I would check there since a lot of Sam and Dean’s clothing is military in style. I can’t to seem to find the boots Dean wears. I ordered the same boots John did and he’s right, they’re way too bulky. I’m thinking it’s because of the steel toe but I’m not sure. Do you know where I can buy some non-steel toe boots that look like Dean’s? I think they look pretty good. I’ll keep searching though, and hopefully find a good replacement for the table at the top. 1. Is Dean ever seen wearing colored tees? Apart from black, like blue, green… oh and especially white? 2. Any idea where Deans robe could be found(seen in the more recent seasons at the Men of Letters bunker). 3. Deans elephant bracelet, most photos make it look like he wears two so I’m wondering if it’s just the separation of the hair that give off the illusion of two or if he wears two of the same bracelets? 1. Yes, I know for sure he wears white and green solid colored t-shirts. For the green, it’d be more of a military/earthy green. I can’t specifically think of a blue t-shirt though. 2. No, but that’s a great question and something I hadn’t thought of adding yet. I’ll look into it. 3. I had the same thought when I originally wrote the guides on Dean. I’m 99% sure it’s just one bracelet, but the separation of the “hairs” make it look like two. He definitely wears two. I own the same bracelets. You can’t get that placement of the two knots like that with the way they fit. Anywhere to get similar types of jeans for chicks? Allen, have you seen the “Rock Never Dies” promo? Looks like dean has a new leather jacket. It’s a black motorcycle style. Kinda sad they got him a new one instead of the old brown coat. Thoughts? Hey Jimmy, it’s hard to get a good look at it, I’m interested to see how it looks on the episode tonight. I’m assuming it’s just going to be used in this episode since it’s about Rock n Roll. I do wish they’d at least try to get his old brown car coat back on the show. I feel like they could buy a Wilson’s and rough it up to make it look pretty close to the original. Do we know what cologne Dean wears? Not Jensen. That’s something I’ve actually never thought of before. He’s a pretty manly character, so I would think there’s a good chance he doesn’t wear any cologne. If you want to find a cologne he’d probably wear, I’d google for some of the manlier, popular colognes. Sorry not about Dean… do you have any idea where I can find that blue jacket that Sam wears in Season 13 episode 9 “The Bad Place”? I’ve been searching for months!